Hockey Hall of Fame Book of Jerseys is a celebration of the Hockey Hall of Fame's collection of the best jerseys and sweaters worn in the game. The brand-new, never-before-seen photographs of each jersey are paired with in-game action images and player profiles detailing the significance of the jersey and the impact of the player on the league. The selection of near 100 jerseys from star players ranges from the rare and seldom seen, like Hall of Famer Rod Langway's high school championship jersey, to the most famous of garments, like Wayne Gretzky's last-ever jersey. The photography is great and, as is always the case with Hockey Hall of Fame book releases, the glossy presentation is second to none. But author Steve Milton really makes this book into a gem with his interesting player profiles. Many of the players names you will recognize - Gretzky, Howe, Richard, while others you will not - Bobbi-Jo Slusar, John Coward, Constant Priondolo. It is that blend that makes this book so fascinating. Hockey fans will be thrilled with this collection and will enjoy the crests, patches, logos, colors, and designs -- not to mention the game-worn wear-and-tear -- of hockey's most distinguishing feature. As an addition to the jerseys of hockey's superstars, readers will be treated to a selection of some of the most unique and rare jerseys from around the hockey world, like Harbin China's Heilongjiang Provincial Sport School jerseys, or the 1936--37 Cleveland Falcons sweater from the inaugural IAHL (now AHL) season. Bobby Hull: 1969 Chicago Black Hawks. 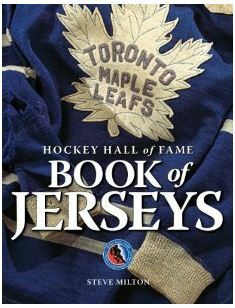 Hockey Hall of Fame Book of Jerseys is a fantastic examination of hockey's most enduing symbol and is the only book on the subject.